Features photograph of Charles Phillips and discussion of Salem Baptist Church's history. 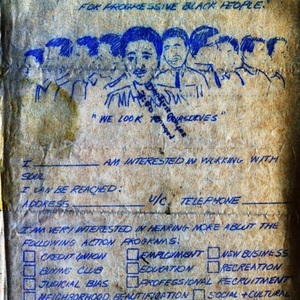 Clippings file for the Progress Association for Economic Development, a social service agency on the 100-block of North First Street in the 1970s. Clippings file at the Champaign County Historical Archives, Urbana Free Library. File on the Community Advocacy Depot, located on the 100-block of North First Street in the 1970s, in the Urban League Archive, in the Champaign County Historical Archives, Urbana Free Library. Directory of local businesses owned and/or operated by African-Americans.